The caravan is a modern 2015 Regal Sanderson with veranda and patio set located on Kittiewake at California Cliffs in a cul de sac leading to Beach Road. The spacious lounge offers a 42" HDTV, DVD player, electric fan heating with flame effect fire. The fully fitted kitchen diner has a full sized dining table and four chairs, four ring gas burner and double oven, fridge freezer, washing machine, toaster, kettle, with a full range of cooking utensils, crockery and cutlery etc. A breakfast bar with two stools. It has two bedrooms plus a pull out double sofa bed so can accommodate 6 if required . The master bedroom is king sized with an ensuite wc and shower, walk in wardrobe, tv with remote fixed bedside wall lights. The larger than average twin bedroom has a double wardrobe. Duvets and pillows are provide but please bring your own bed linen and towels, a babies high chair is also in caravan. Bed linen only can be supplied at an extra cost of £10 per bedroom as an optional extra.The second wc and double shower is off the hall. 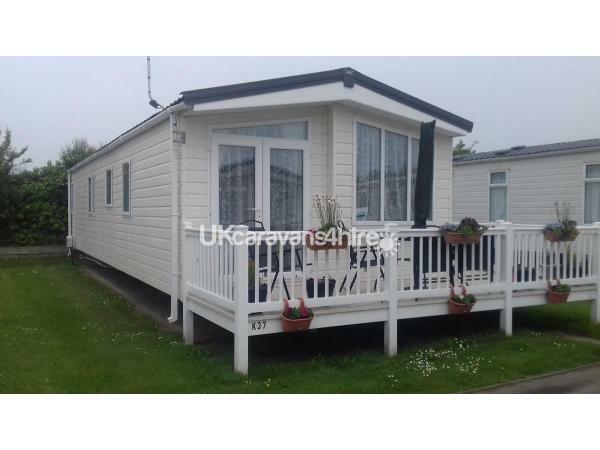 The caravan is fully double glazed with gas central heating radiators in all rooms. Fire alarms and Carbon monoxide detectors are fitted. There is parking for two vehicles alongside the caravan. There is a washing line available to use. Wifi is available at extra cost, just log in to your browser for connection to "Park Wifi". Entertainment passes are available to purchase from main reception. These will give the whole family access to all the facilities at California Cliffs in the clubhouse restaurant, arcade, both indoor and outdoor swimming pools and flumes and show bar and cabaret entertainment. The entertainment for youngsters includes Sparkies Krew Klub. 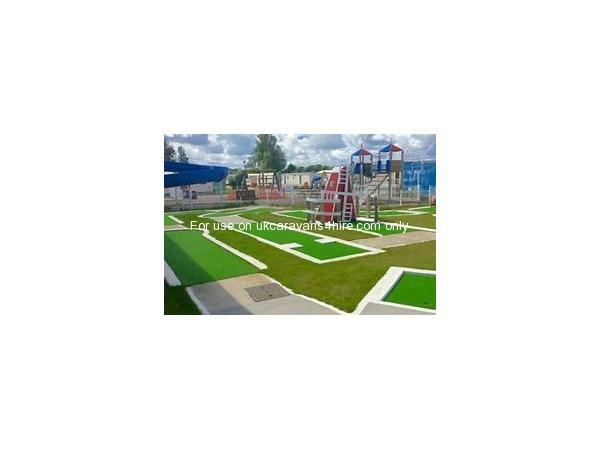 Outside areas include , Crazy golf, children's ride on cars, football and basket ball pitch. Fun bikes can also be hired . Onsite facilities include Mini market, fish and chip shop, launderette. Use of gas and electricity are included in the cost. Bring your own linen or we can supply and make your beds ready for arrival for a minimal charge. Book a holiday of 5 nights or more in 2019 and receive a £50 discount on your next holiday with us. Terms and conditions ,can only be used by the original hirer and not be used with any other promotional offer. 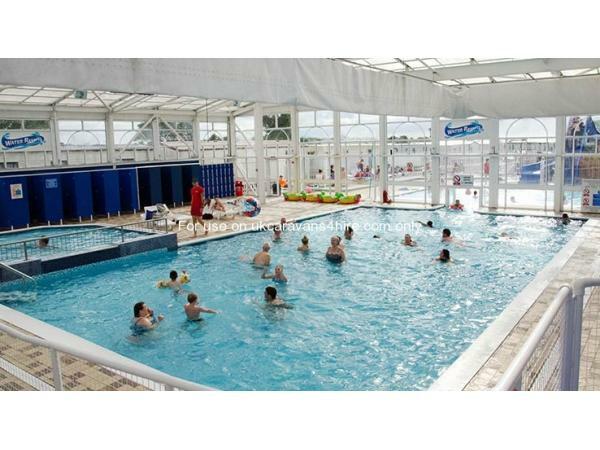 Additional Info: California Cliffs Holiday park has many facilities to offer including an indoor and outdoor swimming pool with flumes. A clubhouse restaurant and bar with pool tables and darts . 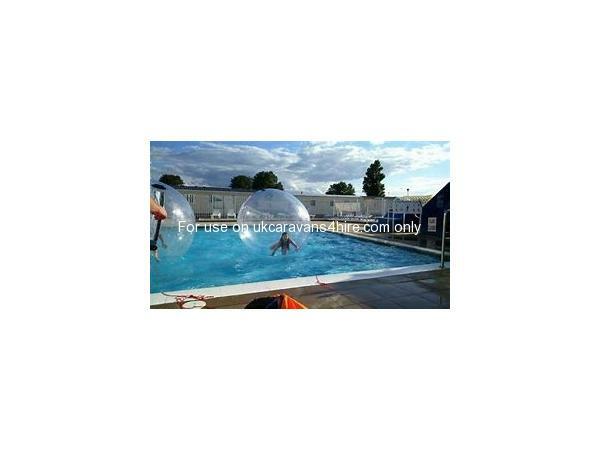 A showbar with nightly cabarets and entertainment including bingo,an amusement arcade, crazy golf, kiddies ride on cars, bicycle hire, basket ball and small foot ball court. Other on site amenities include a fish and chip shop, mini market and launderette. Locally there is a Chinese take away just outside the park gates. Buses run from just outside the gates to Great Yarmouth 4 miles away roughly every 20 minutes. Many attraction are in Great Yarmouth including greyhound racing, stock car racing and horse racing. What a lovely friendly couple Rick and Ann are, they made us feel at home as soon as we arrived. They went to the effort of putting an excellent welcome gift together of very tasty items to make our stay as enjoyable as possible. It was great having a welcome pack folder with all the important information contact numbers etc you may require, and also extra leaflets of the local places of interest to visit, and places to eat. Although we have stayed at other caravans on this site over the years, this caravan has topped the lot for comfort, cleanliness (immaculate) and a lovely spacious layout, home from home, with a nice size TV to watch a selection of films provided on the DVD player. My wife and l loved it so much we did not want to go home; we are now looking forward to another stay we have booked for October. The booking process was very easy, efficient and professional. Thank you Rick & Ann for making our holiday so restful and enjoyable! Karen & Paul thank you for the lovely feedback we do like to make the holiday experience as good as we can and as we would like ourselves. So glad you enjoyed your stay with us and we look forward to your next visit with us. My father and I stayed in this caravan with my 3 year old daughter. The caravan had all we needed! We even had a lovely Christmas hamper on arrival and Ann had kindly decorated the caravan to help keep the festive feel. The accommodation was very clean and we had all clean bedding, which was definitely worth the extra cost. 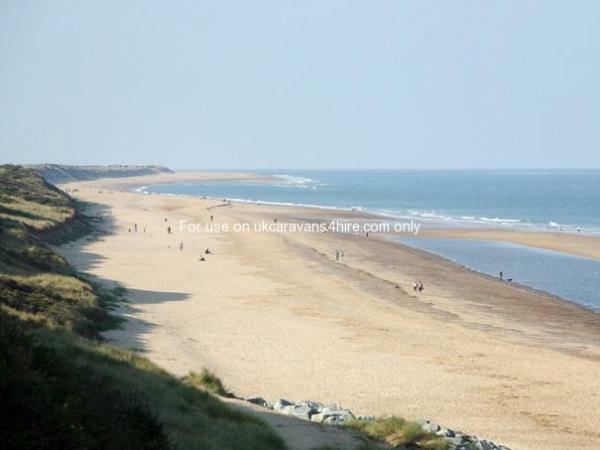 Great location, close walk to the beach and a short drive from the centre and all the shops. I had actually bought the necessities with me, like washing up liquid, toilet rolls, kitchen roll / tea and coffee- but I needn't have bothered as all was there. Would definitely stay again. Thanks you Rick and Ann for a lovely stay. Thanks to Rick and Anne for another wonderful stay in your caravan. As hosts you go above and beyond expectations. The welcome hamper is a lovely personal touch, the homemade birthday cake was absolutely delicious...thanks so much! As for the caravan, it's a home from home, equipped with everything you need and more! Spotlessly clean and set in a lovely spot within the park. We look forward to returning next year! Fantastic caravan, everything you could need, home from home. Catered well for kids, welcome basket was great, as was board games and DVD's. Would recommend 100%. Many thanks for you review glad you enjoyed your stay hope to see you again. Rose. Thank you for your comments it is greatly appreciated. Hope you grandson had a lovely birthday and look forward to seeing you again. Caravan is lovely and clean, has absolutely everything we needed with a young toddler, everywhere was spotless, spacious and comfortable. Nice and quiet area although only a short walk to Local amenities. Owners were lovely, easy to book and find. Will defiantly visit for longer in the future. We found this caravan to be of impeccable quality and everything within it made our holiday home a place we would love to go back too. This caravan has everything and more and as a family of 5, to have a washing machine, was a god-send. We have found the owners truly lovely, who left a very informative welcome pack for us. This caravan is spacious and incredibly clean and full of everything you would have at home. The location is perfect for many days outings. This is situated in a quiet row, but close enough to access the amenities. This caravan comes highly recommended by ourselves and is a truly beautiful place to stay. Tanya Thank you so much for the fantastic review and happy that you and your family enjoyed your holiday at our home. Thank you also for leaving the caravan spick and span.